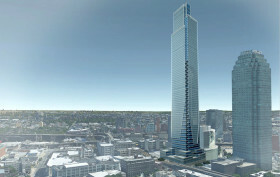 When plans were originally filed in February 2016, the Long Island City skyscraper since dubbed Court Square City View Tower was set to reach 964 feet. In April, it got bumped up to supertall status at 984 feet, making it Queens’ future tallest building. 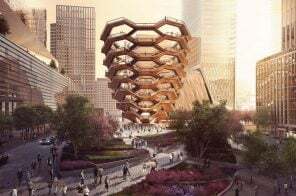 It’s since been dropped to 66 stories, but according to a new project page from architects Hill West (formerly Goldstein Hill & West), it will still be Long Island City’s tallest tower, and therefore the tallest in the borough. 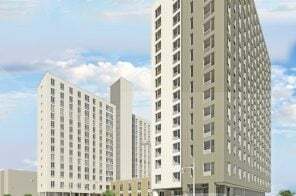 CityRealty first noticed the updated details, which come with the first true renderings of the 800-unit condominium at 23-15 44th Drive. 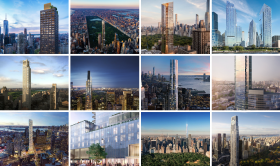 In addition to 360-degree views of Manhattan, the tower will offer an all-glass curtainwall facade, a retail base, and a slew of corner-apartment balconies. 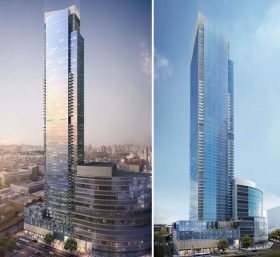 In February, Flushing-based developer Chris Jiashu Xu of United Construction & Development Group filed plans for a 79-story, 964-foot residential tower in Long Island City, giving it the title of would-be tallest tower in Queens. 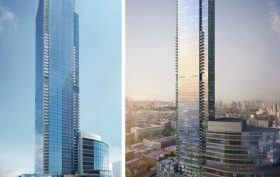 Dubbed Court Square City View Tower, it’s located just north of One Court Square (the borough’s current tallest building at 658 feet), but new information reveals that it will now steal the title by even more of a landslide. The developer put in a request with the Federal Aviation Administration for a 984-foot-tall tower, sending it into supertall territory. And with its mechanical bulkhead, the structure will rise 1,000 feet.